The sweet potato is indigenous to South America, but is often associated with Africa because it is a staple food over much of the continent. Today’s recipe is typical of traditional dishes that rely on just a few ingredients & basic cooking techniques. 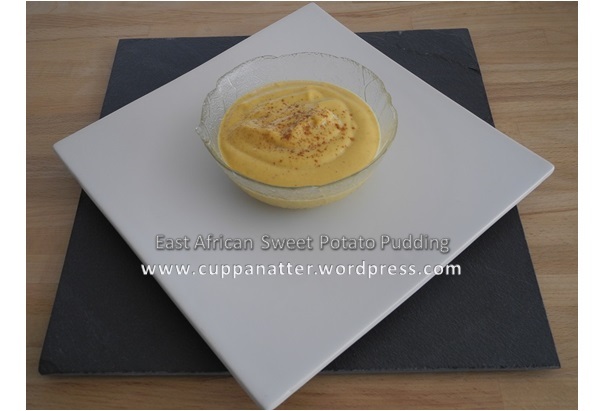 It’s an amazingly creamy and light dessert to serve with any dish, especially African and South American cuisine. remaining ingredients & simmer, stirring occasionally, over low heat for 1 hour, until the potatoes are reduced to a thick puree. Because of the remaining fibres of the sweet potato, this next step is highly recommended: If you have a juicer or blender, pour the mixture in and blend it until smooth; otherwise, using a rubber spatula or wooden spoon, press the puree through a fine sieve into a serving bowl. Serve at room temperature or chilled. Sprinkle a little ground cardamom on surface just before serving. This typical Middle Eastern pie is crammed with lovely contrasting flavours, and a main dish well worth the effort! It looks complicated, but it’s really not – put on some good music, and enjoy the experience! If you want to spread this preparation over two days as I did, then you can dry-roast the spices, toss the meat mixture together raw, and keep chilled in the fridge until you’re ready to put it all together; then, cook the meat mix, wilt the spinach and toss into the meat mixture, along with the roasted spices. When you’re ready to bake it, follow the assembly directions as below. In a pan, dry-roast the spices and nuts together, stirring regularly. It only take a couple minutes – be careful not to allow them to burn. This process brings out the flavours. Set them aside to cool. Sauté the fresh spinach leaves with a bit of oil and salt and pepper; pour into a bowl and set aside for now. Preheat the oven to 200°C (400°F). Sauté the shallots, ginger, garlic and cumin together with the chicken; when the meat is nearly done, add the remaining ingredients and heat through, adding the roasted spices and the wilted spinach, tossing well to mix. Set all aside while you prepare the pastry. Grease a rectangular casserole dish and line with one of the rectangular pastry doughs. Poke with a fork a few times. Pour in the filling mixture, and top with the second dough; pinch the edges together and trim off any excess dough. Brush the top of the dough with a bit of cream, and then pierce several places with a fork. Bake at 200°C /400°F for 35-45 minutes, until the dough is golden brown. 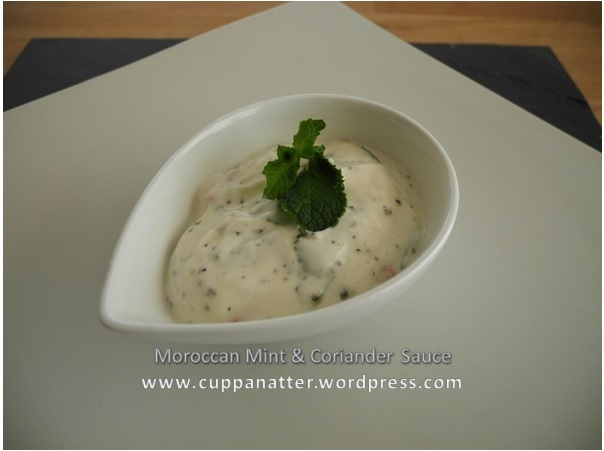 Serve with the Mint & Coriander Sauce. Prepare the ingredients and toss all together, stirring thoroughly to blend. Serve as a side sauce, chilled. Prepare the ingredients as above, and mix all together except the garnish. Chill until ready to serve, sprinkling the garnish atop the sauce. This goes great with any spicy Indian or Middle Eastern dish. If your meal is a spicy one, have a few boiled eggs on hand for your guests; they’ll take the sting out !